What does L'OCCITANE do in order to sustain the production of its key ingredients? In which country are you developing a fair-trade program? What exactly is an organic beauty product? And What is the percentage of organic ingredients in your organic beauty products? Does L'OCCITANE use parabens in her products? Are L’OCCITANE products "vegan" products? Why have you stopped selling this product? L'OCCITANE is a socially responsible company that is committed to limiting the environmental impact of its actions and products. Palm oil is used mainly in the food industry, but also to a small extent in beauty products (less than 5% of global consumption). L’OCCITANE is aware that the farming of oil palm trees encourages farmers in forested areas of Asia to replace the natural ecosystem with oil palm plantations. A round table on "sustainable" palm oil production (RSPO), bringing together growers, oil processors and NGOs such as the WWF, has been created to promote farming methods that help reduce deforestation and preserve biodiversity. Despite the obvious difficulties associated with implementing this initiative, and the vigilance that it requires, L’OCCITANE supports the RSPO for its soap bases purchases. Moreover, we are working to rehabilitate several existing village palm groves in Africa in accordance with the principles of fair-trade and biodynamics. In the long term, we would like to go further in this network structuring approach and establish a sustainable partnership with the local populations by attesting them “fair-trade”. Our Research & Development laboratory is also working on ways to substitute the palm oil used in our candles with other oils. At last, we have sent a letter to all our suppliers, telling them of our concerns about the use of palm oil and asking if they can suggest any alternative products. Natural ingredients are at the heart of the L'OCCITANE product formulas and we apply rigorous and strict quality and traceability criteria. To perpetuate the availability of our products, we are involved in efforts to preserve certain rare species. In 2003, L'OCCITANE launched the first large-scale immortelle plantation in Corsica. We also promote the revival of "forgotten" cultivations. In 2004, L'OCCITANE played an active role in a program to revive the cultivation of the almond tree in Provence, led by the Alpes de Haute-Provence administration. We contribute to promoting traditional cultivations, and particularly that of lavender. There has been a decline in lavender cultivation, and we are keeping a close eye on this situation. Regarding sustainable development, our policy is based on the principle of continuous improvement of our practices, aimed at achieving a greater environmental, economic and social balance. Our concern for the environment is particularly reflected in our choice of ingredients and eco-friendly packaging: Our active ingredients are of plant origin and, when possible, derived from organic agriculture. Our packaging is made with recyclable materials and we limit the use of unnecessary packing material. This concern for the environment is also reflected through our permanent reassessment of the way in which we work, with a focus on being more environmentally responsible. For example: 95% of our goods are transported by road or sea, and we are looking for new ways to further reduce the environmental impact of our supply chain (study into combined rail/road transport). There is a company travel plan for the site in Manosque (car sharing, shuttle bus for employees). An energy-saving plan is in the process of being implemented in all of our sites (occupancy sensors, low-energy lighting, raising employee awareness of energy use). At L'OCCITANE, sustainable development is also about the company's economic and social responsibility. Regarding its suppliers: we ask all our suppliers to sign our code of ethics and we enter a sustainable relationship with them. Sometimes, this can involve working together on a co-development project, as is the case with the women's groups from Burkina Faso, who supply us with shea butter. Regarding society: as the largest private employer in the Manosque employment catchment area, L'OCCITANE contributes to the occupational integration of disadvantaged people (people with disabilities, without qualifications, etc.). This social responsibility to society is also expressed through projects supported by the L'OCCITANE Foundation for the benefit of the visually impaired, women in poor countries, and for the preservation of the "knowledge of nature". Our concern for the environment has led to the use of recyclable, environmentally friendly packaging (cardboard, glass, recyclable plastic, aluminum) and a minimum amount of unnecessary packing material. We strive to use paper or cardboard based on an ecological approach: kraft paper produced from the cleaning up of the Landes forest, paper bearing the Ecolabel, recycled paper produced with seaweed from the Venice lagoon, and recycled paper or cardboard. We also encourage our customers to recycle our packaging. This way, we can all work together to save on natural resources by reusing waste products and reducing the amount of landfilled or incinerated waste. The "Green Dot" logo on our labels indicates that L'OCCITANE participates in European programs for disposal and recycling of all its packaging materials. For over 35 years, we have sourced our Shea butter from Burkina Faso, Africa with a fair-trade approach. Resulting in: we have established a partnership with more than 11,000 women we purchase Shea butter that has been processed in situ - which makes it more financially rewarding for these women than purchasing the unprocessed Shea kernels. For the year 2007 we purchased over 330 tons of Shea butter, i.e. 75% of the Shea butter produced for the beauty industry and exported by Burkina Faso we provide 80% pre-financing for our orders (fair trade requires pre-financing of 30%) so that these groups have the means to equip themselves and purchase supplies of Shea nuts. We regularly monitor production and the needs of these cooperatives by visiting them each year. For 40 years we have supported local traditional production methods and sourced supplies directly from local producers: cooperatives in Haute-Provence for AOC lavender essential oil from Haute Provence, the oil mill in Gard for almond oil, the mill of Haute-Provence for organic AOC olive oil, and a distiller-producer in Corsica for immortelle essential oil. The AOC controlled origin label is used for the product of a specific region or place, whose quality or characteristics are essentially determined by this geographical area. It results from the combination of a production method and a terroir, expressed through man's know-how. We have taken action to help the visually impaired, which includes: the use of Braille labelling on our products since 1996 so that the visually impaired can have access to them, and in English so that it is understood by the greatest number of consumers the creation of the association "Provence dans tous les sens" (All the senses of Provence) by the employees of L'OCCITANE, which introduces visually-impaired children to the world of fragrance creation our financial support for ORBIS (www.orbis.org) - an international non-governmental organization that fights blindness in developing countries through training, prevention and care. Our essential oils are obtained through steam distillation of the plants (stems, flowers, roots, barks, etc.). During the distillation process, steam passes through the plant material. When it cools down, it releases the essential oil and floral water (also known as the hydrolat or hydrosol). Our extracts are obtained through different extraction processes (maceration, infusion, etc.) by processing the plant in a solution, which can then be reduced to the desired consistency, liquid or dry, through evaporation. Cosmetic ingredients of natural origin are derived from elements found in Nature and not from chemistry. An organic beauty product must comply with more stringent standards than the conventional regulations on cosmetic products. These standards guarantee respect for the environment throughout the production chain, respect for the consumer, and a positive emphasis on natural substances of superior ecological quality. Our organic cosmetic products comply with the specifications of the Ecocert "BIO" organic label, which sets the highest quality standards for cosmetic products made with natural substances. Ecocert is an independent certification body that has produced a list of authorized ingredients in this case and insists on: a minimum of 95% natural ingredients or ingredients of natural origin a minimum of 95% of the total plant ingredients certified organic a minimum of 10% of the total ingredients certified organic Synthetic fragrances or colorants, silicones and mineral oils are not permitted. Only certain essential synthetic ingredients are authorized when no natural alternative is available. Some of our products use 100% ingredients of natural origin (the Very Precious Regenerating Concentrate with immortelle essential oil, shea butter, Mom & Baby Balm, etc.). The great majority of our products contain over 90% natural ingredients or ingredients of natural origin. Our ingredients of natural origin are indicated on most of our packaging by two stars ✲✲ in the product composition section. We always strive to use natural, traceable, high-quality ingredients (AOC controlled-origin, organic agriculture), which we source from local farming networks or sustainable development programs. However, to create a product that provides the highest level of safety and performance, we may use synthetic molecules (while always erring on the side of caution) when no reliable and effective natural alternative is available. Preservatives are molecules that prevent microbiological contamination of cosmetic formulas. All formulas need preservatives so that they can be used in normal conditions (kept in the bathroom, everyday contact with the user's hands, etc.). Does L'OCCITANE use parabens in its products?? At L’OCCITANE, we have always used parabens in very low doses (between 0.3% and 0.5%) in conjunction with active essential oils, to prevent the proliferation of bacteria. International legislation allows a maximum of 0.8%. As a company that always errs on the side of caution, we replace parabens whenever possible with other preservatives whose toxicological risks have been fully investigated. Since 2005, over 80% of our new products have been formulated without parabens. Today, all our products are paraben-free. 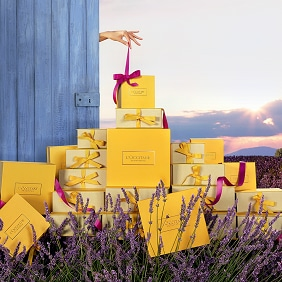 Since its creation, L’Occitane en Provence is intent on offering its customers the best products in terms of innovation, performance and naturality. Faithful to these three values and led by an approach of constant improvement, our brand is always launching new products and tries to satisfy the well-being and efficiency needs of most of the women. But to innovate and launch new products, sometimes we have to give up some products you particularly like. These choices are not easy and that’s why we are trying as often as possible to replace these discontinued products by products with similar cosmetic qualities and high-performance.